With all the publicity around the Iran nuclear deal, not much attention has been given to an equally significant nuclear move: the agreement between the International Atomic Energy Agency (IAEA) with Kazakhstan to establish an independent Low Enriched Uranium (LEU) Fuel Bank. According to energy expert Alan Riley, this initiative could become a key enabler for the worldwide expansion of nuclear power and indeed a key support for a secure future energy world order. It could also be very important for the future of Ukraine. Media headlines have naturally focused on the Iran nuclear deal of late. 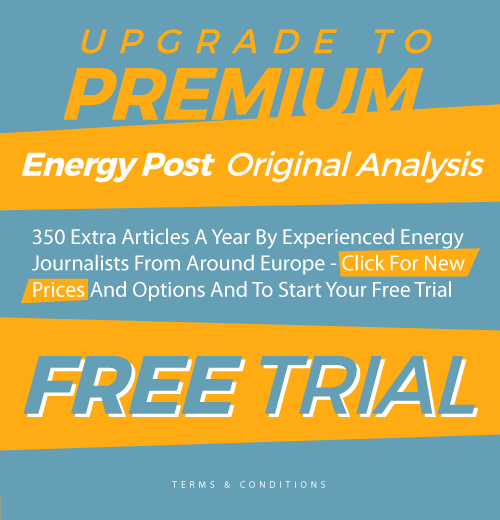 However, what has been largely overlooked is a second deal that was made in June to establish a low enriched uranium (LEU) fuel bank in Kazakhstan. This will underpin the Iran deal and with it the prospects for reduced nuclear proliferation. In addition, this Kazakhstani based nuclear fuel bank will provide supply guarantees to particularly vulnerable civil nuclear power states such as Ukraine. The fuel bank, which comes into operation in 2017, is likely to play a significant role in the 21st century’s global nuclear and energy security architecture. The fundamental difficulty with civil nuclear power is that the enrichment process can be used not only to produce low enriched uranium to fuel nuclear plants, but also highly enriched uranium which is essential to arm nuclear weapons. Given that, according to the International Atomic Energy Agency (IAEA) over 40 states wish to develop civil nuclear power there is a significant danger of additional proliferation with any increase in the number of civil nuclear power states. This proliferation danger was recognised as early as 1953 when President Eisenhower proposed the establishment of a nuclear fuel bank. The idea behind the proposal was that states seeking to develop solely civil nuclear power could obtain from a safe and internationally regulated fuel bank, the low enriched uranium they required to run their nuclear power stations. The existence of an internationally regulated open access fuel bank would remove the need to own enrichment facilities which could be used to also produce weaponised highly enriched uranium. However, due largely to Cold War divisions and Soviet technical ambitions in the nuclear field this proposal did not get off the ground. In more recent times concern over Iran’s nuclear ambitions have seen a revival of interest in the idea of a fuel bank. The existence of such a fuel bank could provide Iran with an alternative source of supply and provide a basis for the development of civil nuclear power. A number of Western powers including the European Union, the United States, Norway, as well as UAE, together with philanthropist Warren Buffett who provided $50 million, put together the funding to establish a nuclear fuel bank. 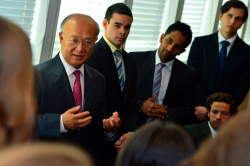 Kazakhstan agreed to provide to operate the fuel bank on behalf of the IAEA. Given Kazakhstan’s good track record in nuclear security – it surrendered the world’s third largest nuclear armoury in 1994 and has run uranium mining and processing safely (it is the world’s largest producer of uranium) – the major powers were able to give the green light to the project. In June Kazakhstan and the IAEA finally agreed to establish the facility at the Ulba metallurgic plant in north-eastern Kazakhstan. The fuel bank, to be opened in 2017, will be owned by the IAEA and subject to IAEA regulations, but operated and secured by the Kazakhstani government. It will hold a substantial amount of LEU, approximately 90 metric tonnes, enough to run a 1000 MW light water reactor (of the 438 reactors worldwide, 350 are light water). States in compliance with IAEA regulations and procedures are permitted to access the facility. A key principle is that the fuel bank will not distort the open market. Hence access is limited to states that have suffered a supply disruption and cannot obtain fuel on the open market. Customers must pay the full economic cost of restocking . The fuel is prohibited from being further enriched, reprocessed or resold without IAEA agreement. The initial motivation for the project was to provide an alternative source of supply for Iran. However, the recent nuclear deal opens up the possibility that Iran could actually become a significant source of supply of fuel for the fuel bank. Under the nuclear deal Iran will be limited to 300 kilograms of LEU for fifteen years. Iran’s current stockpile is 10,000 kilograms of LEU. It therefore needs to dispose, transfer or sell most of its stockpile. The IAEA will be soon putting a tender out to supply the fuel bank with 90 metric tonnes of LEU. This tender will open up a major commercial opportunity for Iran’s nuclear industry. Another benefit of Iran becoming a source of supply for the fuel bank is that it would gain Iranian support. Iran may see the fuel bank as a source of business rather than a western inspired arrangement to weaken its nuclear ambitions. Over time Iran may come to see the facility as it was intended: as a guarantee of ultimate supply to its own civil nuclear industry. In the meantime the fuel bank can provide other states that are setting out to develop their civil nuclear industry with a guarantee that their fuel supplies will not be interrupted. The fuel bank is also attractive for states that already have a civil nuclear industry and are substantially dependent on third states for nuclear fuel. The most notable current example is Ukraine. Approximately half of its electrical power sector is nuclear, and until recently all the fuel for its 15 reactors came from Russia. However, given the disputes with Russia since the annexation of Ukraine, and direct threats from senior Russian politicians to terminate supply, Ukraine has opened up its market to Western nuclear power suppliers. Given the scale of the supply requirement for Ukraine, the existence of the fuel bank could provide Ukraine with a significant additional source of supply if Russian fuel supplies were cut. In short, it is unlikely now that the IAEA nuclear fuel bank in Kazakhstan will play the role initially envisaged when it was conceived. It will not be providing Iran with an alternative secure source of fuel, given the nuclear deal with the great powers. It will, however, be able to fulfil its broader role as supply guarantor for those states seeking to develop nuclear power, and an additional source of supply to those states like Ukraine that may require an additional guaranteed source of supply. And Iran may become a business partner and advocate for the fuel bank. The Kazakhstani fuel bank is the first not under any national control, internationally regulated and open access. If it proves a success it may well expand and become the model for a network of IAEA fuel banks worldwide providing the civil nuclear industry with an ultimate guarantee of supply while reducing the prospects for nuclear proliferation. Alan Riley is a professor at City Law School in London. City University advises governments, EU institutions, NGO’s, and corporations on major strategic problems in relation to abuse of dominance, price-fixing, and merger cases concerning strategic problems in the global and European energy markets. Riley is also a Nonresident Senior Fellow with the Atlantic Council’s Global Energy Center. Additionally, he is an Associate Senior Research Fellow of the Institute for Statecraft and a regular guest columnist on competition and energy law issues with the Wall Street Journal, the New York Times, and the Financial Times. Why anony should still choose nuclear while cheaper renewable energy can provide electricity without carbon emissions and all the failure risks and waste disposal problems is beyond me. Because I don’t live next to the sea, don’t have geothermal, don’t want to flood all my nice fertile land next to the river. I would like to keep my fingers and toes during a windless winter night and not freeze to death. I would like my surgery to continue on even if clouds cover the sun and the wind stops blowing. I would like to have cheap electricity bills like France and not Germany.